With warmer weather officially in the air, you’re probably hankering to take your run outdoors. Those who live in urban areas and cities, though, know that these locations present a unique set of challenges. The sidewalks are crowded with people and the streets are crowded with cars. But don’t let these obstacles set you back. We spoke to Aaptiv trainer Benjamin Green for his best tips on running outdoors in a crowded city. When running outdoors in a crowded city, it’s crucial to see and be seen. It’s important that all traffic—pedestrian and vehicular—is aware that you’re there. So, dress the part. “Wear bright colored clothing,” Green says. “I can’t tell you how many times I go outside to bike or run in the evening and I see even seasoned runners wearing all black.” Bright clothes, he explains, will help runners, drivers, and cyclists see you and help avoid any collisions. Many of us like to bring the least amount of things possible when we go out for a run. However, there are a few necessities everyone should take with them. If you’re running in the evening, he suggests bringing along some kind of light, especially if any part of your route doesn’t include street lamps. You should also make sure to have access to water. For instance, if you’re running through New York City, as Green often does, pay attention to where you’ll find hydration stops. “If you’re running in Central Park, know where the water fountains are.” If you map out your run and your route doesn’t include many water options, bring your hydration with you. Carry a lightweight water bottle or even a water belt for longer hauls. Lastly, make sure you have some money or other means for transportation in case of emergencies. “God forbid you get a cramp or hurt your ankle. Have a subway card, Citi Bike membership, or access to Uber,” says Green. In either case, Green recommends bringing your phone with you on your run. Keep it in an armband or in a fanny pack around your waist. This way, you’ll have a way to call someone in case of emergency. Know when to go around. Keep in mind that metropolitan areas are often visited by tourists. The person you may be asking to move may not speak the same language as you. “Maybe someone is visiting from another country,” Green says. “Don’t get upset with the pedestrians because they’re just walking—the sidewalk is designed for walking.” If you ever do have to veer off the sidewalk and run in the bike lane, stay on the edge of it to avoid getting run over. That said, try to avoid this lane as much as possible and never run in the bike lane with a group. Everyone likes to see pups outside on a warm sunny day. But sometimes these furry friends can hinder your outdoor run, especially if they’re off leash. Green suggests treating the dog as you would a small child due to their unpredictable nature. Be mindful of where the dog is at all times. If you’re trying to keep pace, perhaps avoid them altogether. “Dogs are going to go wherever they want to go. If you’re trying to do very intense interval run and you have to hit this pace at this time, don’t go somewhere where dogs are typically off leash,” Green says. Now, if you’re running with your dog, keep him or her on a leash. This will keep the dog, you, and others around you safe. He adds to be cautious of oncoming cars before crossing, as many drivers often run yellow and sometimes red lights. “Forget about your mile pace [when it comes to intersections.] It’s better to be safe, wait an extra second, and check all corners, even if you’re running through a green light,” he says. Also keep in mind that there could be debris along the sidewalk. For example, Green says, if there was a big rainstorm the night before your run, there may be trash or other natural debris on the sidewalk. “It might not seem like a big deal, but stepping on a pinecone could ruin your foot placement on the ground and you could twist an ankle,” Green says. Pay attention to your path and also be mindful of weather and wind changes that may impact movable objects. When running outdoors in a crowded city, you will come across more obstacles than you’re used to. It’s important to be patient and accept that these obstacles will factor into your pace and time. “If you’re doing an urban run, you have to remember that with so much congestion, you’re going to have to slow down. So don’t get upset mentally over that,” says Green. For those looking to train without interruptions, Green recommends staying off the sidewalks. Find the nearest park and do a few loops in areas where the paths are a little wider to accommodate more outside activity. 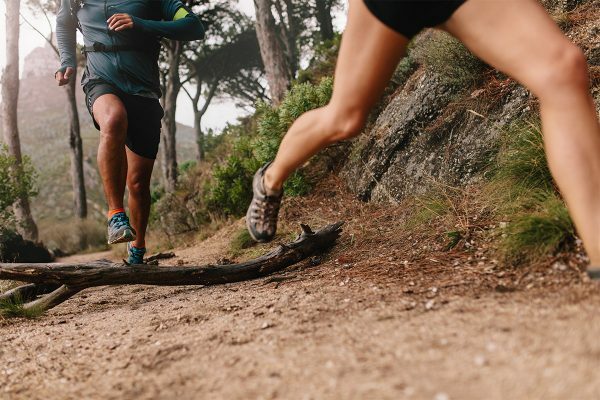 As you lace up and head outdoors for a run in the coming weeks, just remember that running outdoors in a crowded city can be very different from running on a treadmill or even on a running path. Be mindful of your surroundings and patient with your progress. If you ever find yourself feeling frustrated, come back to your breath.